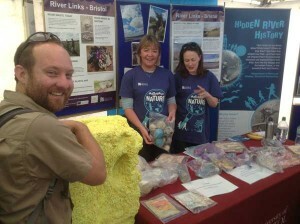 In second week of June, ‘The Power and the Water’ project ran its first ever stand at the Festival of Nature, Bristol’s annual celebration of the natural world. It was a first not only for the project but for the School of Humanities too, as it was the first time a non-science subject had been included in the University of Bristol tent. 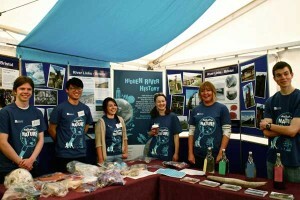 The Power and the Water Team, and 2nd Year Biology Student Volunteers, ready to engage with the public! Photo: Milica Prokic. ‘Hidden River Histories’ took the research that the Bristol-based team members are doing (Power and Water is a three-strand project with researchers at Nottingham and Cambridge Universities too) to create an interactive display that introduced environmental history to a diverse audience. We knew that the Festival is a popular event for all ages and backgrounds. Established in 2003, it is the UK’s biggest free celebration of the natural world with two days of free interactive activities and live entertainment across Bristol’s Harbourside. 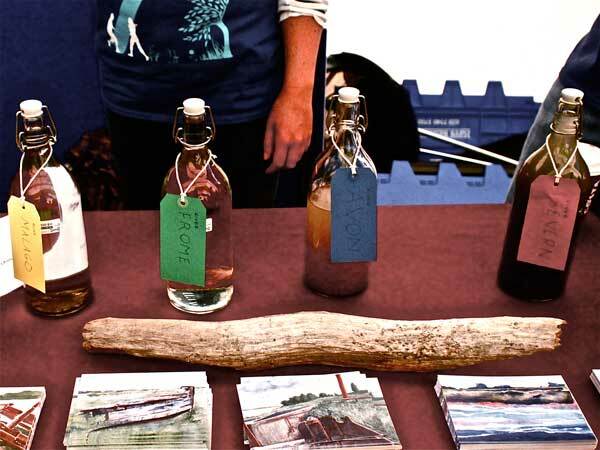 We wanted to introduce the field of environmental history to Festival-goers, and specifically some key themes in our project: how the natural world is intertwined with the human; how past water and energy uses might inform current and future environmental values; and how local issues fit with global environmental change. Talking about river waters and history with members of the public. Photo: Peter Coates. Our stand could not be boring: we were representing History and the Humanities among a sea of Science stands! For the kids we knew would visit (Day 1 of FoN is Schools Day), we had to provide something interactive – something they could get their hands on. Luckily, in environmental history, we have no shortage of fascinating natural, and unnatural, items to work with. River waters from four ‘Bristol’ rivers, the Severn, The Avon, the Frome, and the often-forgotten Malago (Bedminster) bottled in clear glass took an idea that was originally inspired by a Canadian artwork to become an interactive way of thinking about tides, water quality, rivers-as-ecologies, and a quick way of testing people’s knowledge about their local rivers. Kids shook up the river waters and urgh-ed at the murky Severn and Avon. But they were fascinated to see old photos of salmon fishing and a beached whale in the estuary (in 1885), and we were able to talk about how ‘brown’ is not always ‘bad’, and how, from a salmon’s perspective, a nicely tidal, turbid (unbarraged!) River Severn is exactly where you’d want to be. The ‘pure’ Frome, on the other hand, was the river that was so dirty in the 19th century that the city chose to bury it. Bottled water from the Bristol’ rivers, the Severn, The Avon, the Frome, and the Malago. Photo: Milica Prokic. The bottled rivers were a way-in to talking about Bristol’s watery past, but we also wanted to discuss Bristol’s water future, particularly with an issue that we’d observed on field trips down to the riverbank at Sea Mills (a suburb of Bristol). On the intertidal zone there, plastics are a huge problem, brought in on the tides. The issue of marine litter connects local environmentalism with a global plastics issue – the river banks of Sea Mills with the Great Pacific Garbage Patch. We collected a huge array of discarded plastic items one morning in May. Guided through Health and Safety requirements by the Centre for Public Engagement, we decided to bag the plastic items (in yes, more plastic – the irony was not lost) and create a Trash Table, in which the rubbish was laid bare for the public to see, pick up, question and discuss. 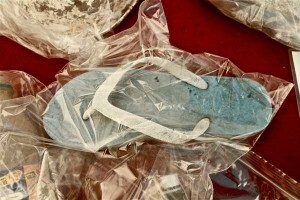 It had something of a forensics scene about it, compounded by the presence of numerous, enigmatic, lost shoes. We’ve been discussing ‘future archaeology’ as an interesting methodology, and it provided us with our key question: what stories would future historians and archaeologists tell about us now, based on these non-degrading plastics? In addition to confronting the environmental impacts of consumer culture, visitors to the stand could engage in some informal, but not inconsequential, narrative building. 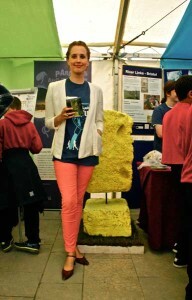 Artist Eloise Govier and her hi-vis installation, made from polystyrene found by the Avon. Photo: Milica Prokic. Though an exercise in public engagement in itself, we were able to highlight other public engagement and knowledge-exchange initiatives we’ve been working on. Artist Eloise Govier has been collaborating with researcher Jill Payne on installations that encourage people to think about energy. 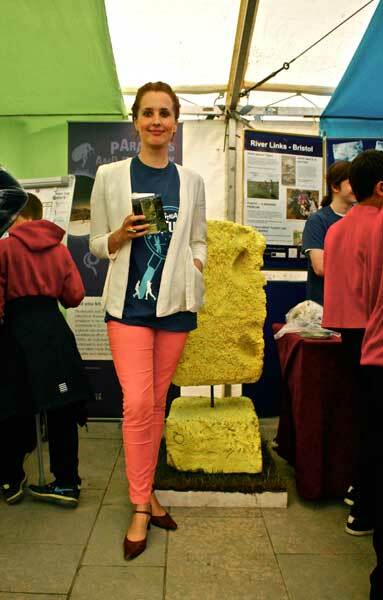 Her high-vis block of polystyrene – sourced on our forage along the Avon – was a great talking point, likened to cheese, Spongebob Squarepants, fatbergs and a meteorite! Artists from the Bristol Folk House also contributed works, based on an outdoor workshop we ran at the Ship’s Graveyard on the River Severn at Purton. We made them into free postcards that included our project website and contact info, encouraging future communication. The watercolours updated our visual record of the river and helped us to think about how people see and value the River Severn today, and how this connects with – or departs from – traditions of viewing land- and waterscapes in Britain. A 3-day presence at the Festival of Nature was the culmination of months of planning by me and Jill (Payne, researcher on Power and Water). We had our first meeting before Christmas, and plenty since! Was it worth the effort? Unreservedly, yes. In terms of disseminating our project research, FoN allowed us to communicate our work – and raise awareness of the vitality of environmental history at Bristol – to a huge number of interested citizens. We await attendance figures for this year but last year, over 4, 385 people attended the UoB tent. In 2013 it was 6, 284. This year the weather was good and there were queues to enter the UoB tent, so we are confident that attendance was a strong as ever. But public engagement of this kind goes way beyond sheer numbers. The process of planning the stand has been productive, helping us identify the themes in our work that hold interest (and are therefore useful for telling histories, in and beyond academia). The photo of the 69ft whale beached at Littleton-on-Severn was a side-story to my research, but people were fascinated by why and how this creature came to Bristol. A trip to Bristol City Museum to track down the bones is being arranged, and the animal inhabitants of the river will be more visible in my work as a result. Moreover, good public engagement goes beyond disseminating research. They may be buzzwords in funded research, but ‘knowledge exchange’ and ‘co-production of knowledge’ are very real benefits of engaging with groups and individuals beyond the academy. For a project like ours, which is interested in public environmental discourses and people’s relationships with place, talking with the public is a key source of information, and a way in which we can build research questions, identify key issues, and meet people who can aid our research. We learnt of more hidden rivers in Bristol, community action groups, and old records of the Severn Bore. We were also asked why we were not being more active on the issue of plastic waste, prompting us to reflect on the aims of the project, and the role of academics in communities where sometimes, actions speak louder than words. It was useful to recognize our strengths and limitations, as perceived publicly, and to articulate our key aim of providing sound research from which people can become informed, and motivated. Getting involved in an event such as Festival of Nature is a useful reminder that rather than ‘us’ and ‘them’, we are the public too, offering a particular set of knowledge and skills but equally willing to learn from others. The Power and the Water project would like to thank the Centre for Public Engagement (University of Bristol) for all their logistical and design support; the 2nd Year Biology volunteers that helped man the stand with enthusiasm; Eloise Govier, for the loan of her artwork and for helping on School Day; and Milica Prokic and Vesna Lukic, for filming, photographing, and mucking in over the FoN weekend. Thanks to Mireia Bes at the Centre for Public Engagement for attendance numbers. Great write-up Marianna, I wish I could have been there! I fully agree with your last paragraph on the language of impact used in academia at the moment, and how the actual practice of public engagement is a much more fruitful two-way stream. Great coverage, Marianna! It’s particularly timely, too, that environmental history made its first appearance in the University of Bristol tent at the Festival of Nature in Bristol’s year as European Green Capital! (See Jill’s piece on this site). I just wanted to underscore Marianna’s point about learning as much from visitors to our Festival of Nature stand as they learnt from us and our display. Yes, there were residents of Bedminster who didn’t realize that a river flowed under their streets (the Malago) and those who, despite many visits to the Ikea and Tesco superstores at Eastville, did not appreciate that the Frome flows close by, largely hidden under the M32. In that sense, we did make hidden rivers visible. But others already possessed a high level of awareness. A member of FrANK (Friends of the Avon New Cut, a tidal waterway dug out as part of the construction of Bristol’s Floating Harbour, 1804-09), told me about the group’s regular riverbank clean-ups. A member of the Bristol Civic Society encouraged us to join the campaign for a clean-up of litter in the Floating Harbour. And there were others who taught us a thing or two. I did not know that artist Kurt Jackson walked up the Avon from Bath to Avonmouth and then exhibited his works at the Victoria Art Gallery, Bath, in 2007 and 2009. I was also grateful to meet someone who works for Eunomia Research and Consulting, a Bristol-based environmental consultancy whose clients range from waste management companies and local authorities to third sector organizations and the European Commission. The Eunomia project brought to my attention is one that is investigating the contribution of river-transported litter to Europe’s marine waste, through monitoring stations for plastic particles near the mouths of the Danube, Elbe, Po and Rhine. According to an progress report for the EC (31 March 2014), ‘rivers, next to wind, are thought to act as important transport pathways with estimated contributions of up to 80% of marine litter pollution’. Do you feel that the visitors who were interested in the Power & the Water stand knew that it was an ‘unusual’ stand – that it was a history/humanities stand amongst a sea of science? Or was this difference ‘academic’? Hi Erin, interesting question – I actually didn’t get a sense, in my interactions with visitors, that there was any surprise at there being a history stand in amongst the sciences. Which poses the possibility that we are institutionally conditioned to focus on an Arts/Sci divide, rather than work across and with our differences. FoN was a really good opportunity to work literally alongside our scientist colleagues and find out about their work – and we had to go off-campus to do so. I think that, to a broader public, it makes perfect sense to have histories of environments and animals alongside scientific studies of such things. Which encourages me to consider links with Biological Sciences in the future. Many of the students, for example, expressed real interest that there was a historical perspective to their studies. My experience was somewhat different from Marianna’s. A number of visitors to our stand that I chatted with had never heard of environmental history. But they were pleasantly surprised to find out that historical study these days involves more than just people (whether kings, queens, barons, bishops and generals or peasants, proletarians, foot soldiers and the enslaved). This popular sense of the restricted scope of historical research was confirmed when I visited the pop-up Museum of Water down at Bristol’s Harbourside that same weekend (http://www.bristolaquarium.co.uk/news/water-museum/). 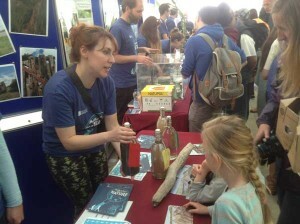 To quote the person – a hydrologist – staffing the stall outside the museum who sold me an aluminium water bottle (bearing the logo of the Bristol-based Frank Water charity [‘safe water saves lives’]; http://www.frankwater.com/%5D): ‘I’ve never met a water historian. I had no idea there was such a thing’.